Let’s begin by taking a smallish nap or two. Let’s start with a quiz: what do the following have in common? Albert Einstein, Nikola Tesla, Leonardo Da Vinci, Winston Churchill, Johannes Brahms, Eleanor Roosevelt, Salvador Dali, John F. Kennedy, Thomas Edison, Napoleon Bonaparte, Nike, Google, Huffington Post, NASA and Deloitte Consulting. “In Spain, you go for a sleep in the afternoon, it’s a siesta. In the UK you go for a sleep in the afternoon its depression” as comedian Kevin Bridges skilfully observed. There may not be much of a nap culture in the UK but napping is engrained in the daily routines of many cultures around the world, most notably in countries like Spain, China and Japan. In Spain a nap is called a siesta, which is common knowledge. However what you may not know is Spain has a National Siesta Championship. That’s right, competitive sleeping. For money! I’m sure I speak for all students when I say, if you’ll pardon the pun, that is the ultimate dream – to be paid to sleep. Japan has nap bars where individuals pay for a comfortable bed, complete with soft music and an alarm, to sleep in for 20 minutes on their lunch break. It is also totally acceptable to sleep on the job in Japan as it displays exhaustion from hard work and being committed to ones job. 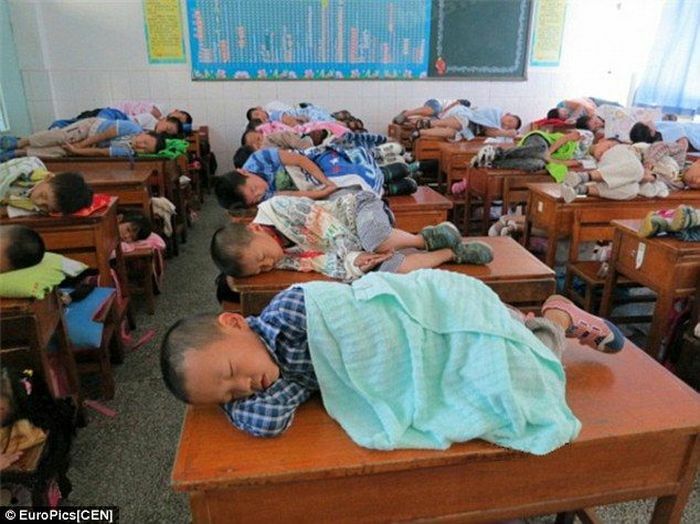 In China also, a lunchtime nap is traditional and completely normal as you can see from the picture below. With entire nations adopting napping as the normal daily thing to do, there must be some reason and benefit behind it. Luckily, as always, this is where science and psychology come in to provide a helping hand. There is no overstating the power of the humble nap. There are many psychological benefits to be gleaned from it as naps are essentially exercise for the brain. The idea of a nap being good for you came to prominence in 1999 when social psychologist and legendary sleep researcher James Maas published his book: ‘Power Sleep’. Within the book he details how small bursts of sleep during the day can help your daily functioning, and in doing so he coined the term ‘power nap’. One of the main benefits of napping is its effect on memory. The longer we stay awake, the less our capacity for taking in new information. Once your short term memory storage is full, there is essentially a big bouncer at the door of your hippocampus telling all these new facts there is just no more room. This is why all night studying sessions with no sleep are bad for you and your learning. Science backs this up – all nighters reduce your ability to learn new information by a whopping 40%! So most of that extra cramming time you spend the night before an exam is just wasted, and would be much better spent sleeping. Instead of opting for an all nighter, take naps during the day and get a good nights sleep instead. One of the purposes of sleep is thought to be memory consolidation, and this occurs during the second stage of sleep which starts 5-10 minutes from the moment you fall asleep. Within the memory consolidation process, information is moved from short term memory (in the hippocampus) to long term memory (in the prefrontal cortex). As a result, your short term memory store is cleared and room is made for new information to come in. Napping for less than 30 minutes therefore ensures you get the benefits of this second sleep stage, i.e. memory consolidation, and you can learn and retain more information than you would if you stayed up all night or didn’t nap at all. Research has even suggested that with a short nap, you are getting the benefits of a whole night’s sleep for aspects of memory such as declarative memory, motor memory and spatial memory. Napping also improves your alertness, productivity, creativity and general performance. Pilots in a NASA study napped for 26 minutes in the cockpit and the result was a 54% increase in alertness and a 34% increase in general performance. Even fMRI studies assessing napping showed that brain activity for nappers remained higher throughout the day i.e. people were more alert and generally sharper. This also means you are less likely to procrastinate as you have more focus, which is always a good thing! 1) 20 minutes is ideal: Set an alarm to ensure you don’t sleep longer than this. A nap of this length prevents you from entering deep sleep (and sleeping for the whole afternoon) and also prevents you waking up groggy and disorientated, a feeling known as sleep inertia. 2) Do it between 1 and 3 pm: This period is when our body and mind naturally gets tired and our alertness drops. Plus it is early enough so that it won’t stop you sleeping at night. It’s also important to do this consistently and regularly for maximum benefit, so keeping to a schedule may be handy. 3) Go dark and stay warm: Wear an eye mask, close the blinds or switch off the lights – do anything to darken the room as this will inevitably make napping easier. Also keep a jacket on or blanket over you as you’ll need something to keep you warm as your blood pressure drops during sleep. 4) A coffee nap: This one is optional. Drink a cup of coffee right before you have a nap. Caffeine takes around 15-20 minutes to have an effect so when you wake from your nap, you’ll have the benefit of both the nap and the caffeine. This is a very obvious tip, a plain no brainer, but one which is often neglected. Exercise and looking after your body are essential keys to a healthier, happier and more energetic life. Apart from the obvious physical benefits, there are many psychological benefits resulting from exercise which include: improved mood; reduced stress as well as an improved ability to cope with stress; improved self-esteem; improved body image and importantly, decreased symptoms associated with depression (programmes longer than 10 weeks are best for dealing with long term depression). It takes as little as 10 minutes of aerobic exercise to induce the positive effects above. For longer term benefits, 30 minutes of moderate intensity exercise 3 times a week is recommended. Want some advice on where to start? Try the NHS Live Well page and Livestrong. Mindfulness simply means to live in this very present moment, acknowledging and being aware of all the intricacies that are combining to make this particular moment. The practice of mindfulness has it’s roots in Buddhism and in recent times has become popular in the Western world largely due to the work of Jon Kabat-Zinn. He is the pioneer of a form of therapy called Mindfulness-Based Stress Reduction (MBSR), which aims to reduce daily life stress by employing mindfulness practices. Another program which utilises mindfulness as a form of therapy for psychological issues is Mindfulness-Based Cognitive Therapy (MBCT). This is used primarily to successfully treat depression. A great deal of scientific research has gone into mindfulness practices and unsurprisingly a huge number of benefits have been found. You’ll be a better learner: This isn’t just conjecture; it is the scientifically proven truth. It’ll improve your attention, and increase your focus and the result of this is of course the slaying of that demon that haunts students everywhere – procrastination. It even boosts your memory and cognitive functions, but best of all, these effects occur within just 4 days of starting mindfulness practices! On top of all of this, mindfulness has even been shown to improve fluid intelligence and standardised test scores. Decreased stress and negative emotions: Lower stress is always a good thing so that doesn’t need explaining. Mindfulness is commonly used in therapies to successfully treat depression and anxiety. Research has even shown mindfulness is as effective as using anti-depressants to combat depression. Starting a new academic year, a new university or just university life in general can be very stressful. We all know that. But remember, there are always people you can talk to if you need. Stronger immune system: We surely can’t afford to miss lectures (…right?) and exams, and no one likes to be ill either. 8 weeks of mindfulness training, and in a subsequent study 5 weeks, is all it took to boost the immune system. There are physical changes: This underlines the strength of mindfulness practices. Apart from the mental benefits mindfulness provides, it also causes physical changes in the brain. 30 minutes a day is all it took to produce an increase in grey matter density in brain areas associated with memory, stress and empathy. For all you neuro-geeks out there, here is an in-depth look at the brain on meditation, and a video of a presentation by Stanford psychologist Kelly McGonigal about her research into how meditation changes the brain to reduce pain, depression and suffering. Weight loss and healthier eating; reduced rumination; less emotional reactivity; a shift from negative to positive affect; reduced symptoms of post-traumatic stress disorder; increased relationship satisfaction; treatment of sexual dysfunction; sharper intuition; reduced symptoms of ADHD; increased morality; improved sleep and treatment of insomnia; increased empathy; increased compassion; lower blood pressure; reduction of chronic pain; increased gratitude and increased patience. Phew! Believe it or not there are actually more benefits but I think you get the idea by now. All those benefits may sound like the work of some magical potion, but they are not. They are the result of something which is very simple and accessible. I can’t think of many things, or any single thing, that has more psychological, physical and social benefits than mindfulness. It is absolutely one of the most powerful tools at your disposal in your life. So you’ve read about all the benefits and now you want them as much as a pair Louboutins (only if you are a girl of course…or a guy too if that’s your thing). How do you go about getting them? You are in the right place to find out! To practice mindfulness, you need to meditate. The word itself probably brings up an image of someone sitting (floating is optional in this image) cross-legged in a forest with their index and thumb pressed together while the back of their hands rest on their knees. Or it brings up an image of Grandpa Chatterji. That could be your reality of mediation if you want it to be, but it is a lot simpler than that and a lot simpler than most people think. It is just about directing your entire focus towards one particular thing. Mindfulness is very simple to practice at any time wherever you are. You don’t need to do a lot of research, you don’t need to create a mindfulness schedule, you don’t need to buy anything, there are no monthly fees and you don’t even need to leave the house – just stop what you are doing and focus inwardly. Being completely in the present moment – that is all mindfulness is. Try any of the exercises below daily for however long you can (ideally at least 20 minutes), and you’ll soon start to experience the benefits mentioned above. The best times to practice the mindfulness exercises are: first thing in the morning, whenever stressed, on your lunch break (produces similar benefits to napping) or at the end of the work day. The only bad time to do the exercises would be before bed. With any of the exercises, your thoughts may bounce to other things when you are trying to focus. Don’t worry about it, you are not trying to empty your mind and push out other thoughts. Just notice when your focus has drifted, and then simply bring it back to what you originally intended to focus on. Mindful Breathing: This is the easiest one to do anywhere at any time, because your breath is always there with you. This method is also quite discreet, so it could be done on the train or bus without people giving you weird looks or avoiding sitting next to you. Raisin Meditation: You’ll need a raisin for this one. Or any item, it doesn’t really matter what you pick – a raisin, another food item, a flower or your mobile phone, it’s all good. In this exercise you slowly use all of your senses, one after another, to observe everything about the object in the greatest detail possible. Everything from how it feels in your hand, to how it looks and to how it tastes (only for edible items of course). Body Scanning: Here you simply observe what is going on with your body. Close your eyes and focus your attention slowly from your head to your toes, one body part at a time. Notice the sensations, what are you feeling in each body part? Walking Meditation: This last one is about observing your body as you walk. Take a walk, take slow steps and notice the sensations as your feet touch and leave the ground. How is the rest of your body moving too? Pay attention to everything that is going on. For more mindfulness reading and exercises, check out Psychology Today, Greater Good, Pocket Mindfulness and Zen Habits. This is a little marvel of a book for those with an interest in Psychology. It is written around a simple premise: Pooh is a superb psychologist and psychotherapist who employs every method put forward by any psychologist or psychoanalyst somewhere in his adventures. Written in the style of Freudian case notes, it cleverly intertwines psychological theory with illustrations and extracts from Winnie the Pooh books. As one reviewer on Amazon.co.uk said: “The more you know about psychological theories and Winnie-the-Pooh, the more you will enjoy this book”. The final Winnie the Pooh entry in this series will be up in a few weeks and will cover topics such as over thinking and patience amongst other things. See you then!